You could rescue a creature of yours and any Auras you had played on it, or simply get back that Angelic Destiny now that you've got a better creature to play it on. You could straight up destroy a creature... if you can afford to lose the life (and since Orzhov is all about life gain and drain, you probably can). Or you could do a passable impression of Proclamation of Rebirth-- although the strongest thing about that card was the fact that it could be reused. Orzhov Charm's third ability is only as good as your best one-mana creature, if it had flash. Still, you can retrieve a creature from your graveyard or battlefield or kill one of your opponent's creatures. Orzhov Charm definitely wants to be in a deck that wins or loses off its creatures, in a format where creatures are the most important thing. In a sense, it's unfortunate that all the guild charms help different game plans, because that makes it harder to shove them all in a deck, name it "The Charmed Ones," and put a stock photo of Piper, Phoebe, and Paige on your deck box. Orzhov Charm makes it even harder, as you kind of have to stretch to find a use for all three modes within one deck. Not that it's not good at all three of those - shoring up the main weakness of Aura decks, being almost as efficient as Terminate, and locking people out with Kami of False Hope would each be worth a card on their own. Orzhov Charm is so powerful that you'd be justified in naming any deck that leans on even one of those modes "The Charmed Ones." Welcome back readers todays card of the day is Orzhov Charm which has a lot of flexibility. In standard the ability to save a creature and all auras attached to it bodes well for the recent advent of hexproof aura decks providing a powerful and versatile application of this card. The second ability destroying a creature and losing life to its toughness can be strong and a possible game winning piece of removal because even if your taking five for killing a dragon or similar sized threat if you had no other way of interacting with it this card has done its job albeit at a steep price. The final ability returning a one casting cost creature may see a small amount of play but is less exciting than other options. Overall in standard I can see this card in sideboards or maindecks of Esper based control decks or Esper aura style decks. In modern this card could slot easily into a white/black Martyr of Sands build due to the cards versatility and interaction with the named card as well as being a white card itself. Otherwise it could see moderate play in control style decks. In legacy and vintage I don’t foresee this making a splash. In casual and multiplayer its versatile and I think all the charms will see some amount of play be it one on one or multiplayer. In limited its creature removal or a way to save your creature or possibly recur an important one, a solid pick overall. Today's card of the day is Orzhov Charm which costs one White and one Black for one of three effects. The first returns target creature you control and all auras attached to it to your hand which is decent as a response to removal, particularly in builds that are normally vulnerable for using multiple auras. The second effect of destroying target creature and you lose life equal to the toughness is okay in a pinch, but many other removal options exist without that kind of drawback for the same mana cost. The final choice of returning a converted mana cost one or less creature from the graveyard to play is somewhat situational, though the right deck can easily take advantage of instant speed summoning of various one or zero mana choices. Overall this is a decent support card in a deck using auras and one mana creatures of note, with the value decreasing as those two aspects are reduced. In Limited the chance of having this at the same time as a creature with an aura or a one mana creature in graveyard is lowered. Even with that at least one scenario out of saving a creature from removal, needing to destroy something where the penalty is equal or less than the alternative, even getting a blocker when needed should come up during just about any game. Combined it worth the second or third pick in Booster, barring really notable in color alternatives, and should always be used in Orzhov builds for Sealed. Welcome back to the card of the day section here at Pojo.com. It is Charm week here this week as we are looking at all the Charms from the coming set, Gatecrash! Today's Charm is the Orzhov Charm. Orzhov Charm costs one white and one black mana and is an uncommon instant. 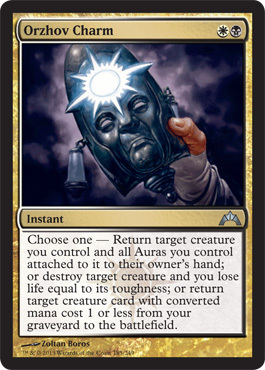 Orzhov Charm's three abilities to choose from are: Return target creature you control and all Auras you control attached to it to their owner's hand; or Destroy target creature and lose life equal to it's toughness; or Return target creature card with converted mana cost 1 or less from your graveyard to the battlefield. While Orzhov Charm is still not my favorite of the Charms, it still has more useful abilities than some of the others. A really well rounded card that all of the abilities could in fact be utilized in really any game. This in my opinion makes it a strong third place in the usefulness of the new Charms, behind the Boros Charm and Simic Charms. The first ability is great if you've invested a lot to enchant a creature of yours, and someone is about to Murder it, or board wipe. Then you will effectively be able to rebuild that strategy, hopefully not to see it die again. The second ability is really not a great one. There are much better options. However, Charms take the place of some of those cards simply due to the diversity you gain in using the Charm. So in this instance, I can see Orzhov Charm replacing a Murder or Go For the Throat. And the best time to pull this trigger is in response to some massive pump, you lose a little life in exchange for not taking a massive thump in the face. Particularly useful against Gruul decks using the Bloodrush mechanic. The last ability is really odd. There are few good zero or one drop cards worthy of being brought back. This ability really could have been made much better by instead of defining the cost, allow the player to pay life for the cost of the creature, that I feel would have suited the Orzhov better from a flavor stand point. But instead, this is what we have to work with. There might be some things upcoming that are worthy of such a card. But I guess for the moment, it is not going to be all that impactful. A decent Charm in comparison to a couple of the others, but not nearly on the same level as the Boros and Simic Charm's.